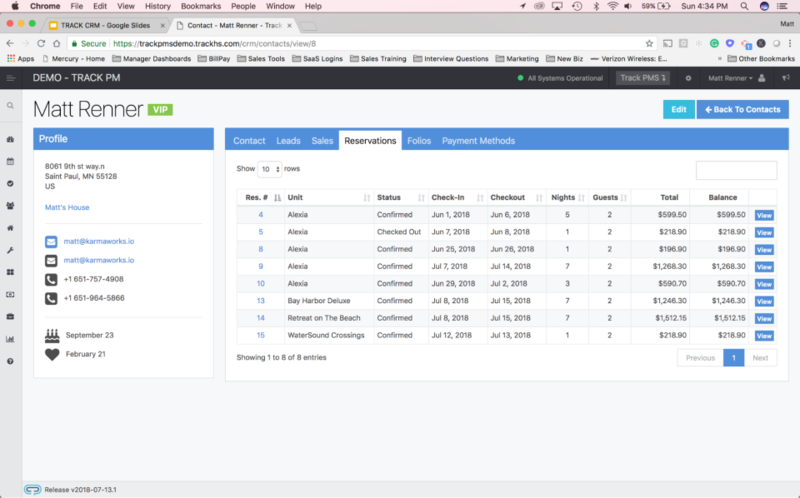 TRACK CRM is built specifically for the hospitality industry. 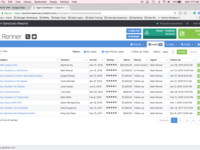 TRACK CRM Reviews Recently Reviewed! TRACK - Truly is "ON TRACK" with features & value! Pros: Track as a Company continues to expand their development of software over the last 13 years and my relationshop has only grown since the beginning. We embrace and live in their Track-Pulse Call Center software and appreciate a deep integration with Springer Miller Systems our PMS. The depth & the flexibility of configuration allows you to be flexible on monitoring "what matters most to you" and I learn "best practices" from their teams' and other customers talent! Cons: It is my nature to always want "more" than any software vendor gives. So I do hear, "not yet" from them, when asking about a feature or function. But I have that with EVERY vendor. I see improvements all-the-time though. Overall: The team is down-to-earth honest people and I can speak with a person that I have a relationship with. Not a call-center where I am just another ticket. There is noting impersonal about this Company. All great relationships are about "people" not "software". They got-it-going at Track. Track is a great way to help communicate with our guests! Pros: Track has a very helpful reports menu. 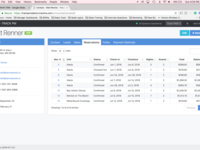 We use these reports for monitoring productivity, phone campaigns, queue abandonment, and call auditing. The end of month Executive Summary that is sent out is also very informative and gives us our progress on certain areas at a glance. This software is nicely laid out and fairly easy to navigate. We enjoy having the option to email the guest who we just spoke to on the phone with a followup info email or link to a brochure. If there is ever an issue with communication between Track and our PMS or if we have questions regarding the system the customer service team is very quick to respond. Cons: It would be helpful if there was a notification feature on the Agent Dashboard that would alert agents to voicemail messages immediately. Currently, we have to check for voicemails manually ever so often to make sure they are answered, or pull up our email to see if any messages have come through. Overall: Overall, our experience with Track has been very positive. 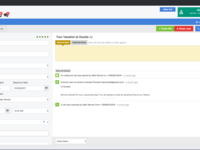 We look forward to finding new ways to use the reporting features and CRM in the future. Pros: It's an all in one communication tool - Phones, emails and chat! Overall: Track has been very responsive to our needs and its clear they value our relationship. With Track we have been able to improve our customer call experience through the call recording and auditing functions and we have implemented outbound call campaigns which in turn has increased our conversions and bottom line! 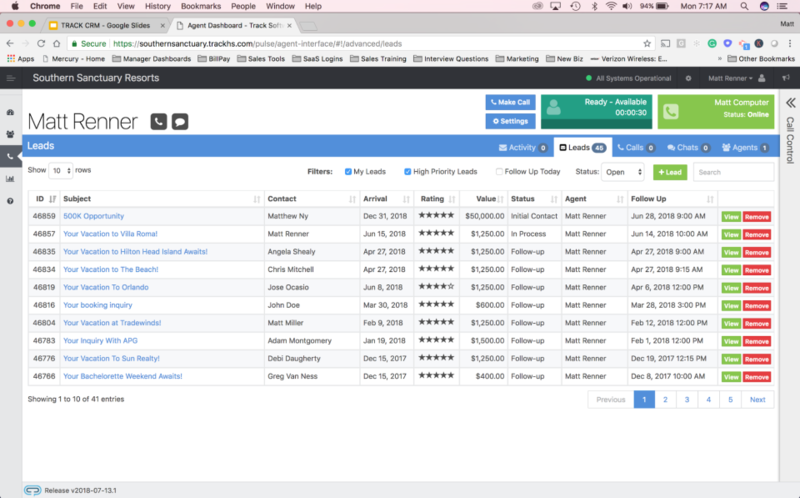 Pros: It's easy to use and it helps us manage our leads, agent productivity, and guest information. We can create and track different campaigns and the reporting capability is extensive. Special requests are almost always accommodated. Cons: None - any issues we run into are quickly responded to by the support team.